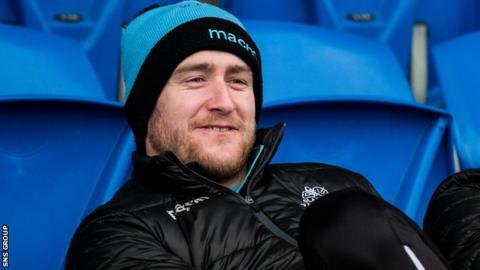 Glasgow Warriors head coach Dave Rennie is "pretty confident" Stuart Hogg will be fit for Saturday's Champions Cup quarter-final against Saracens. The Scotland full-back, 26, has not played since sustaining a shoulder injury in the Six Nations loss to Ireland on 9 February. However, fellow international Tommy Seymour remains a doubt. "Tommy will be close but I am pretty confident Hoggy will play," said Rennie. Winger Seymour, 30, suffered a rib problem as Scotland lost to Wales in the fourth round of Six Nations matches. Ryan Wilson, Huw Jones, Nick Grigg, George Horne, Lee Jones and George Turner were the other Scotland internationals to miss the weekend win over Cheetahs in the Pro14 through injury, along with DTH van der Merwe. Sam Johnson, Ali Price and Jonny Gray were rested, with Adam Hastings on the bench, while captain Callum Gibbins returned from ankle surgery to open the scoring against the South African side. Warriors were well beaten by Saracens in their only previous quarter-final appearance two years ago and lost both meetings with the English side in the pool stage this season. But Rennie is unconcerned by Warriors' underdog status and wants his players to grasp the opportunity of taking the club into the last four for the first time. "It creates a little bit of history, doesn't it so it is always exciting to be part of," said Rennie. "We are happy with where we are at. It is a massive challenge and it is a different level to what we have played in recent weeks. "We are rapt to be still part of the race, 12 teams got a week off in Europe and we are going to go there and throw everything at it."